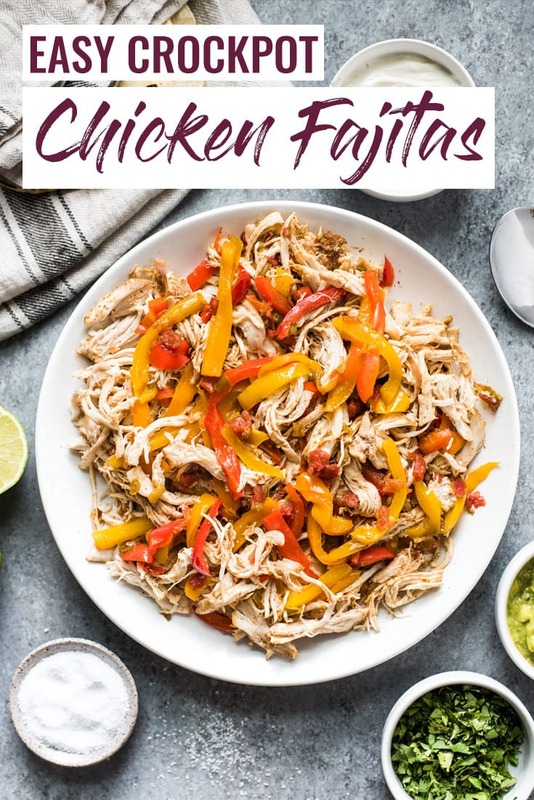 Get ready because these crockpot chicken fajitas are going to become a staple in your kitchen for weeknight meals and easy lunches! I love my slow cooker so much. I use it for soups, stews and meats a few times a month throughout the year, and at least once a week when the weather gets chilly. Not only does it make juicy and flavorful dishes that make the house smell amazing, but it’s so simple and easy to use, it’s perfect for those lazy days when you just want to set the slow cook timer and then forget about it. Since it’s now officially fall (hello there, sweater weather! ), I’m going to be using it on the regular so definitely expect more slow cooker recipes on Isabel Eats. 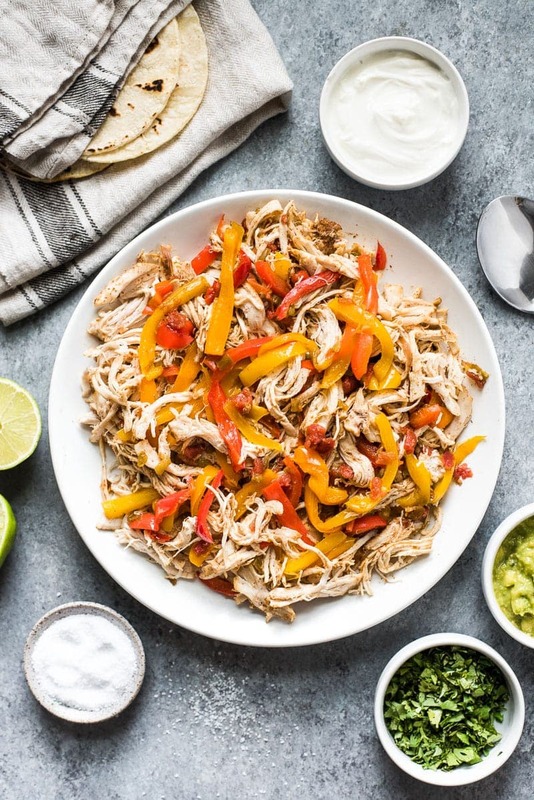 Join me in kicking off slow cooker season with these crockpot chicken fajitas! These crockpot fajitas are made with only 6 easy to find ingredients that you probably already have in your fridge. Even though they’re fairly ordinary on their own, through the magic of the slow cooker, all the flavors come together to make delicious fajitas without much effort! 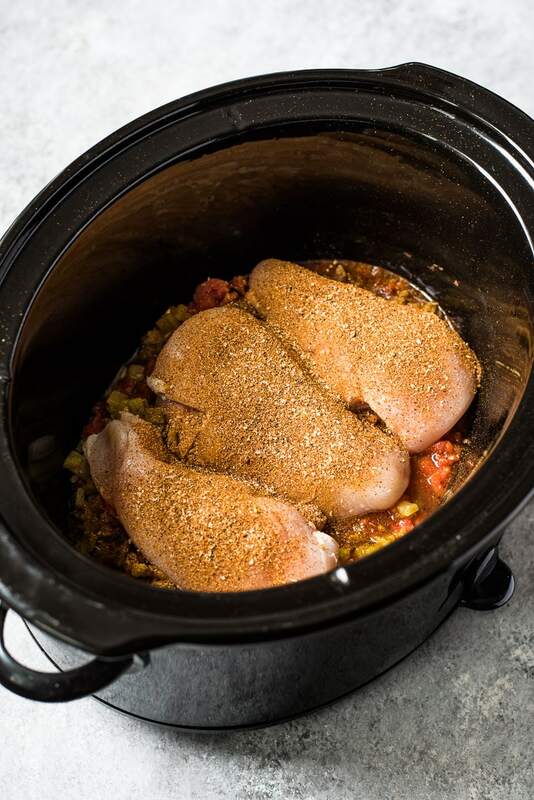 Chicken – I used boneless, skinless chicken breasts to keep things on the lighter side, but you can use chicken thighs instead for a richer and juicier flavor. Taco seasoning – I’m a big fan of making your own taco seasoning instead of buying pre-made store bought packets. Not only does it save me money in the long run, but it also ensures that my seasoning blend is free of fillers, preservatives, added sugar or funky ingredients that are often found in the pre-made packets. Here’s a super easy recipe for homemade taco seasoning that I love. Diced tomatoes – 1 10-ounce can is all you need. I used regular diced tomatoes, but you can use any of the canned varieties like fire-roasted, with garlic and onion or with green chiles. Any of those will work. Diced green chiles – A 4-ounce can of green chiles will do the trick. You can use either mild or hot depending on your preference. I usually try to use the hot version if I can find it at the store, but both will work. Bell peppers – You can use any color you choose! I used red and yellow bell peppers for these photos, but I often use mostly green bell peppers since they’re usually cheaper in the grocery store. Lime juice – Don’t forgo adding in some freshly squeezed lime juice at the end or right before serving. You’d be surprised at how much of a difference it makes! Place the diced tomatoes and green chiles in the slow cooker. Place the chicken breasts on top and season them with taco seasoning. Add in the sliced bell peppers, cover and cook for 1 more hour. Remove the chicken from slow cooker, shred with a fork and place it back in the slow cooker. Add in some freshly squeezed lime juice, mix everything together and taste. Season with salt to taste. 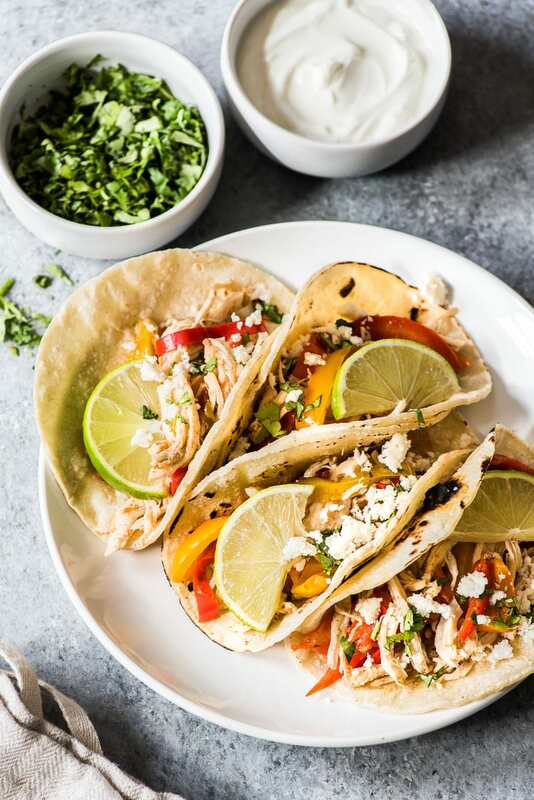 My personal favorite way of serving chicken fajitas is in warm corn tortillas topped with fresh cilantro and cotija cheese, but here are a few other ideas to jazz up your weeknight meals. Like this slow cooker recipe? You may also like these! Add diced tomatoes and diced green chiles into the slow cooker. Place the chicken breasts on top and season them with taco seasoning. Add the sliced bell peppers on top of the chicken, cover and cook for 1 more hour. Remove the chicken from slow cooker and shred with a fork. 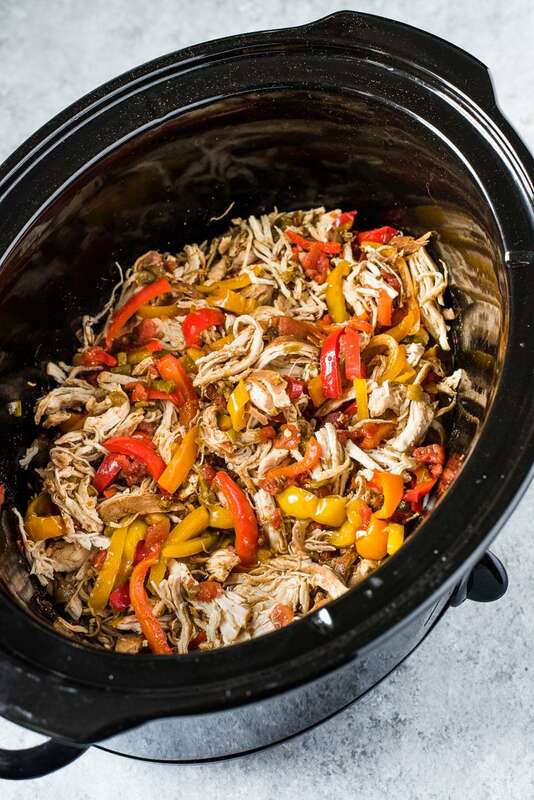 Transfer the shredded chicken back into the slow cooker. Add freshly squeezed lime juice, mix everything together and taste. Season with salt if necessary.